Bone Broth is something that has recently come into the culinary “lime light”. 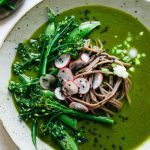 Supremely nutritious and with a plethora of healing properties, bone broth is a trend that has the culinary and health industries going wild. It is a warming soup or drink made from boiling either bones or vegetables to release all of the nutrients and form a flavourful broth. 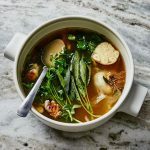 Broth is seen as an anti-inflammatory, as well as an “elixir” to speed up healing, calm allergies and aid fatigue. It is a time consuming process as the ones or vegetables have to boil for hours, if possible even over night. But produces very flavourful, nutrient dense results. 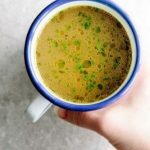 There are now a number of grocery stores that stock bone broth; chicken, beef and even vegetarian options; so if you don’t have hours to spare you can simply buy some! People drink it as a superfood beverage, but it can also be enjoyed with ramen, fresh or steamed vegetables, meats or rice. So how about next time you have a cold, you level up your chicken soup with bone broth, for an extra dose of healing!